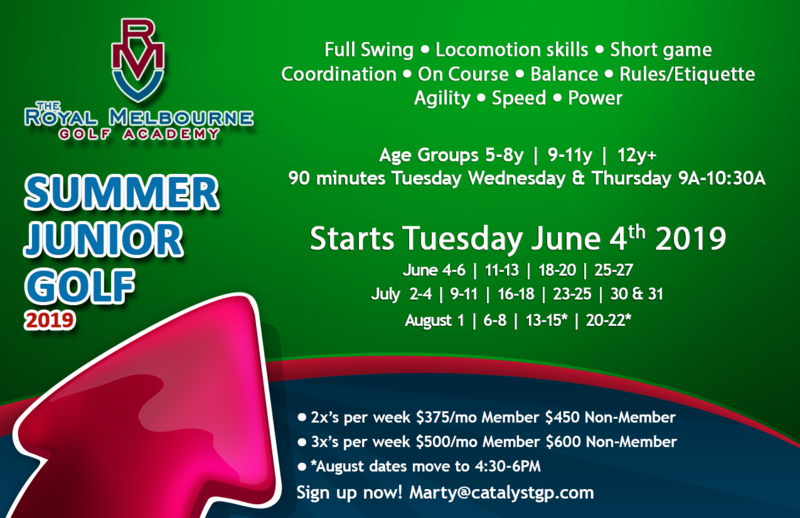 Royal Melbourne Country Club in Lake County is proud to offer a variety of summer activities for kids. We tailor our youth programs to children of all ages, so your kids will have an unforgettable experience every year. Royal Melbourne offers a camp filled with fun summer activities for kids of all ages. Camp Royal is for children ages 4-12. The Junior Tennis program will have lessons available for all ages and skill levels. From the Tiny Tots - aged 3 - 5 years to our more advanced players in the Tennis Academy, RMCC children will have a great summer on the courts. In our Junior Golf Program, your children will learn the game in a fun and rewarding environment. Instruction will cover the FUNdamentals of the game with an emphasis on developing their fundamental movement skills (FMS). Each week the program will involve instruction, Fundamental Movement Skills development and golf or near golf experiences. Acceptable ages to participate in the Junior Golf Program are from 5yrs and up. Download Jr Registration Form Here! Click here to watch a short presentation discussing what you can expect from this junior program. What people are saying about this. "The individual attention from instructors and athletic assessments will ensure that he not only enjoys golf , but will also help him with his other sports."